Days before I began my presidency at Creighton University, on June 18, 2015, Pope Francis released his groundbreaking encyclical on ecology. In Laudato Si’ he affirmed nearly 30 years of Catholic teaching that human-caused climate change is an urgent moral issue which damages the earth, threatens human life and dignity and unjustly burdens the poor. To celebrate the third anniversary of Laudato Si’, I am proud to join 600 other U.S. Catholic educators and leaders as a signatory to the Catholic Climate Declaration. The declaration calls on President Donald Trump to remain in the Paris climate agreement and announces that the U.S. Catholic community is “still in” on actions to meet the goals of the agreement. Read more here. The covenant’s Climate Energies program has lined up nearly $10 million in projects to help dioceses, parishes and Catholic organizations install energy-efficient and renewable energy projects. Jesuit Fr. 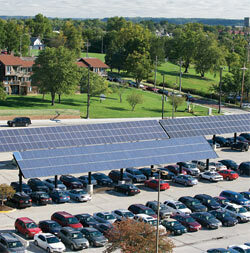 Daniel Hendrickson, president of Creighton University, told reporters June 18 that the Omaha, Nebraska-based school has decreased its greenhouse gas emissions from electricity by nearly 25 percent, a savings of $2 million, and remains committed to its goal of achieving carbon neutrality by 2050. Mayors, county executives, governors, tribal leaders, college and university leaders, businesses, faith groups, and investors are joining forces to continue to support climate action to meet the Paris Agreement. The Nebraska State Climate Office (NSCO) is an organization dedicated to delivering science-based climate services at the local and state level. NSCO’s focus is on weather and climate monitoring, climate services, and stakeholder engagement. NSCO’s office includes operation of the Nebraska Mesonet, a state-wide weather observation network with nearly 70 locations across Nebraska that assess local conditions. Climate Change: What does it mean for Nebraska? This entry was posted in Nebraska / Midwest News and tagged climate action, climate change, Creighton University, Laudato Si', Nebraska State Climate Office, Nebraskans for Solar NewsBlog, We Are Still In on June 23, 2018 by Helen Deffenbacher.